You have worked hard all year and wanted to treat yourself with something different for the summer. You decided to arrange a journey to South-Africa to enjoy the beautiful natural scenery. Discovering the range of wildlife in immense national parks, hiking in mountains, and meeting with warm locals made your journey unforgettable. You arrived at one of the best photography spots in a national park just before the sunset. While focussing on capturing the best image from the picturesque scenery, you got bitten by a Marsh mosquito, perhaps infected with a Plasmodium falciparum parasite. This parasite is known for causing malaria, the most significant parasitic disease of humans. You are not the only one: approximately 30,000 travellers from industrialized countries contract malaria each year. During the next 14 days, this parasite will differentiate and proliferate in the body. It will invade and destroy the red blood cells, eventually affecting the liver, spleen, and brain functionality. A few days after the bite, you found a small-scale laboratory for the malaria diagnosis test, but there was a problem: this laboratory can detect malaria only if you have 50-100 parasites per microliter of blood, occurring when the patient carries the parasite for weeks. You, then, had to find a larger laboratory equipped with a benchtop loop-mediated isothermal DNA amplification (LAMP) system, which can detect 1 malaria parasite per microlitre of blood. You wished there was a highly sensitive device for malaria diagnosis at the point of need. Well, we might have some good news for you. Modern nucleic acid testing methods of malaria detection, such as LAMP, enable high sensitivity, high specificity, robust, and rapid analyses for asymptomatic infections. As performing these methods requires bulky and costly peripheral equipment and trained technicians, access to such equipment in rural areas is unlikely. Fortunately, researchers in Pennsylvania State University recently introduced a stand-alone, portable, and high sensitivity system that can perform “sample-in-answer-out” analyses. The system consists of a compact disc and a reader unit (Figure 1). The compact disc includes valves and microfluidic channels, where the blood sample is processed using magnetic beads. 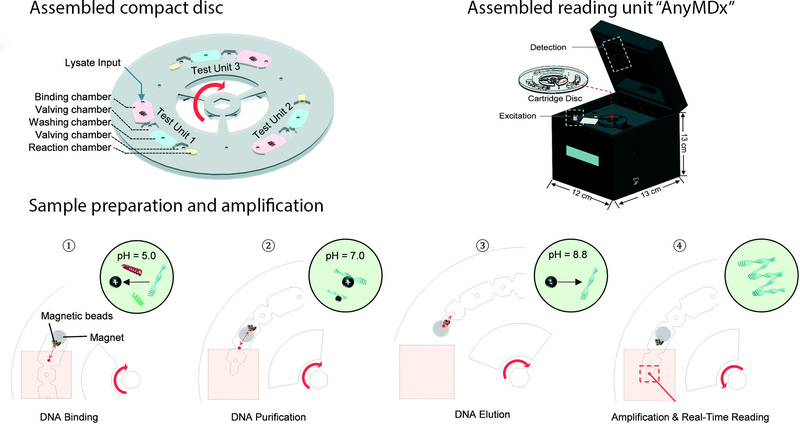 The reader unit can automatically perform all analysis steps including DNA purification, elution, amplification, and real-time detection. For a real demonstration of how the test is performed, the movie included below is well worth the watch. Test results can be displayed on a LCD screen or a smartphone within 40 minutes. The system can detect down to 0.6 parasites per microliter of blood. Each test costs around $1. With these specifications, this technology has the opportunity to create a new paradigm in molecular diagnosis at the point of care. Figure 1. Schematic view of an assembled compact disc made of PMMA; AnyMDX reading unit consisting of a magnet, heater plate, optical detection system, and LCD screen; and the illustration of integrated sample processing steps on the compact disc. The technique is based on DNA-carrying magnetic beads actuated against stationary reagent droplets. 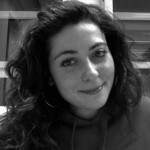 Burcu Gumuscu is a postdoctoral fellow in BIOS Lab on a Chip Group at University of Twente in The Netherlands. Her research interests includedevelopment of microfluidic devices for next generation sequencing, compartmentalized organ-on-chip studies, and desalination of water on the microscale. Researchers at National Taiwan University design grating structures to prevent air-water interfaces from destroying lipid bilayers, enabling robust bioassays of synthetic membranes. Supported lipid bilayers (SLBs) are useful as platforms to simulate cell membranes for evaluating transport of toxins and viral particles1 and screening new pharmaceutical reagents. Yet a significant challenge is maintaining the integrity of SLBs throughout an experiment. Air-water interfaces, commonly formed during reagent changes and rinses, peel apart SLBs and delaminate them from the substrate. Strategies to preserve SLB integrity involve coating SLBs with polymers to increase their rigidity or adding proteins and sugars to form protective layers with a high bending modulus above the membrane. These methods modify the chemical structure and environment of SLBs, preventing analysis of membrane properties and specific assays of membrane-tethered species. 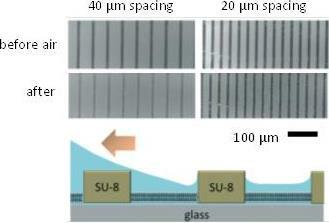 Thus, Chung-Ta Han and Ling Chao developed a substrate with patterned gratings to prevent air-water interfaces from directly contacting SLBs when an air bubble is introduced into a microchannel with SLBs. The grating structures, fabricated by standard photolithography, are perpendicular to fluid flow in the microchannel and act as obstacles to air-water interfaces contacting SLBs directly by a ‘tenting’ mechanism (see figure at right). Holding the obstacle height constant at 2 μm, Han and Chao evaluated obstacle spacing at different flow rates influenced SLB stability after treatment with an air bubble. 40 μm spacing was found to efficiently preserve SLBs from air-water interfaces at a practical range of flow rates: 60 – 6000 mm/min. The authors also confirmed the integrity of the membranes by comparable diffusivity measurements within the SLBs before and after air-bubble treatment. Finally, the authors demonstrated that air bubbles did not affect receptor-ligand interactions between species embedded in the SLBs and surrounding buffer when SLBs were protected using the microfabricated obstacles. This platform uses integrated barriers to protect SLBs from air-water interfaces, creating SLBs with native properties to study biomolecule behavior within membranes and perform high throughput analytical assays utilizing synthetic membranes. Download the full article now – free* access for a limited time only! Chung-Ta Han and Ling Chao. Lab Chip, 2015, 15, 86 – 93. I. Kusters, A. M. Van Oijen and A. J. Driessen, ACS Nano, 2014, 8, 3380-3392. *Access is free until 06.02.15 through a registered RSC Publishing account. Congratulations to Dr. Sangeeta N. Bhatia, winner of the 2014 Corning Inc./Lab on a Chip Pioneers of Miniaturisation Lectureship. The picture shows Lab on a Chip Executive Editor, Harpal Minhas (Left) and Director of Polymer processing in Organic & Biochemical Technologies, Science & Technology at Corning Incorporated, Ed Fewkes (right) presenting Sangeeta (middle) with her award earlier this week at the µTAS 2014 Conference. 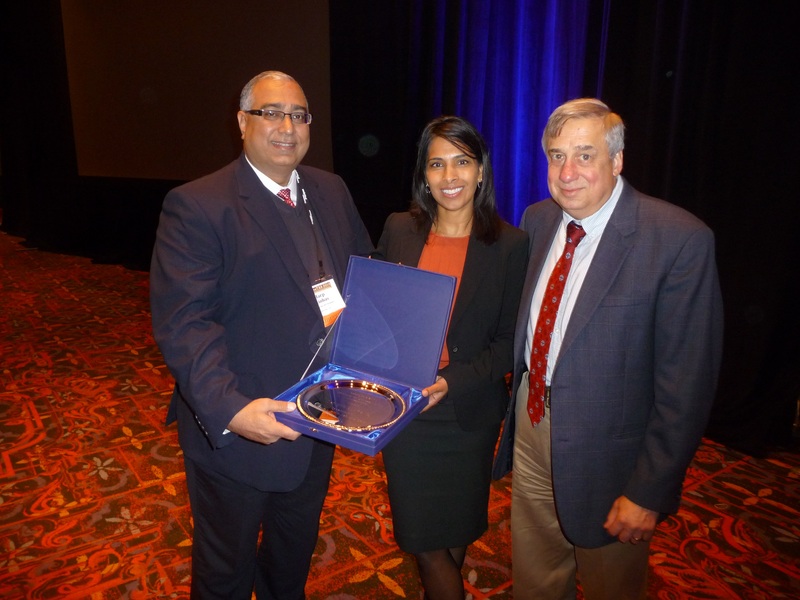 The 9th ‘Pioneers of Ministurisation‘ Lectureship, is for extraordinary or outstanding contributions to the understanding or development of miniaturised systems and was presented to Dr Bhatia at the µTAS 2014 Conference in San Antonio, Texas in October 2014. Dr Bhatia received a certificate, $5000 and gave a short lecture at the conference. Further information, including past winners, can be viewed on our homepage. Issue 11’s significant front cover article from Ikuro Suzuki et al. at Tokyo University of Technology, Japan, describes the development of a new 3D etching method. An infrared laser allows tight control over the area of cell adhesion, selecting cell number and cell type, as a small area of the collagen gel substrate can be targeted. The researchers can guide neural network formation using this tool. 3D networks are created upon which neurons survived longer than on 2D substrates. Work from Jeoren Lammertyn et al. is featured on the inside front cover. The team from University of Leuven, Belgium, use digital microfluidics to facilitate single-molecule detection for the first time. They are able to print and seal thousands of femtolitre droplets in microwells in each step. Single paramagnetic beads can be loaded into the microwells with high capacity. A Frontier article from Aydogan Ozcan et al. at University of California, Los Angeles, USA, discusses progress in computational lens-free microscopy on-chip and how such technology is taking over conventional bulky optical microscopes. This article, which is also featured on the back cover, includes a discussion of the applications this new technology opens up. 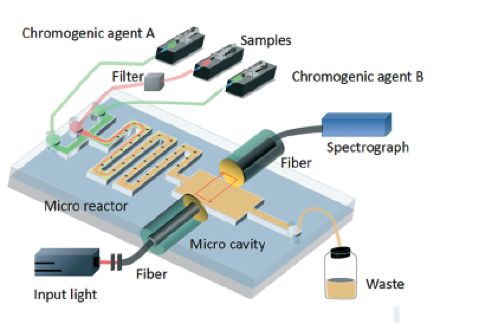 A team from Caltech and MIT, USA, and LeukoDx, Israel, have combined a microflow cytometer and fluorescent dye to produce a portable suitcase-sized point-of-care test for leukocyte count – one of the most common clinical tests. The test can identify four different types of leukocyte using only a small blood sample. This article was featured on the bright cover of Issue 7! A technical innovation from Oliver Hayden and Michael Helou et al. in Germany featured on the outside front cover of Issue 6 also concentrates on flow cytometry for point-of-care testing. This vastly different technique uses magnetophoresis instead of fluorescence to detect specific cancer cells in whole blood. Cell diameters are measured from time of flight information. The device integrates sample preparation for ease of point-of-care applications. The can perform cell enrichment, cell focusing and background elimination in situ. Remember all of our HOT articles are made free to access for 4 weeks*! Research led by Jan van Hest and Floris Delft at the Institute for Molecules and Materials, The Netherlands, is highlighted by the front cover artwork. Their research finds a robust way to control the immobilization of azide-containing ligands on a surface for surface plasmon resonance sensing (SPR) using strain-promoted cycloaddition on a cyclooctyne-modified surface. Don’t forget our cover articles are free to access for 6 weeks*! On the distinctive outside back cover, fascinating collaborative work between the Ohio Center for Microfluidic Innovation at University of Cincinnati and the U.S. Air Force Research Laboratory on a device termed artificial microfluidic skin, which mimics human perspiration with a view to replacing human and animal testing of wearable materials. Of course Issue 10 also includes Research Highlights from Ali Khademhosseini. In this issue, he focuses on lab-on-DVD devices for HIV diagnosis, atherosclerosis and muscle repair. As featured on the bright inside front cover of Issue 5, this HOT article from Teodor Veres and colleagues at the National Research Council and McGill University, Canada, steps towards low cost point-of-care sensors for disease diagnosis. The team present their all-polymeric nanoplasmonic microfluidic (NMF) transmission surface plasmon resonance (SPR) biosensor. SPR, involving light stimulated electron oscillation, is advantageous for sensing as it means label-free, real-time detection with high throughput and automation. The device is miniaturised with a view to small, point-of-care applications. The approach involves nanostructures called nanogratings for transmission SPR, which gives a more stable response. The signal can be turned by altering their characteristics and they are easily fabricated en mass. Thermoplastic materials present an advantage over traditional PDMS for such miniaturised SPR devices as they are more mechanically robust, inert, transparent and crucially viable for large scale production and commercial applications. The novel aspect of this work is that the nanostructured surface and the microchannels are incorporated into one substrate quickly and at low cost. Thermoplastic valves are used in large numbers for the first time for a multiplex detection scheme. They demonstrate its application in sensing glycoprotein sCD44 at picomolar to nanomolar concentrations. Further work by the group is focused on integrating this device with a CCD spectrometer. The packed Issue 9 begins with an editorial celebrating over three decades since the birth of microfluidics by Lab on a Chip Associate Editor Abraham Lee. Submit your work to his editorial office today at http://mc.manuscriptcentral.com/lc! The winner of the 2012 Art in Science Award presented at October’s MicroTas meeting was Yi Zhang, from Johns Hopkins University, USA and the striking winning image is featured on the outside front cover of Issue 8! A description of the winning image and advice on what makes a worthy Art in Science submission are discussed in the editorial by Michael Gaitan from NIST, USA, and Harp Minhas, Editor of LOC, who were part of the award selection committee. In keeping with the artistry of the front cover, work from Shoji Takeuchi et al. in Japan is featured on the inside front cover of Issue 8. In this paper, they address the problem of how to exchange the solution within a droplet for a new solution, for example to introduce membrane proteins or to wash-out applied chemicals during ion channel analysis. They use microfluidic channels to carry out solution exchange by droplet contact in under 20 seconds with the membrane still intact. Cover articles are free to access for 6 weeks*! The back cover features the laboratory of Sergey Shevkoplyas at Tulane University, USA. The communication by this laboratory describes their simple point-of-care test for sickle cell disease using characteristic patterns made by blood samples on paper, which can even differentiate between sickle cell disease and those healthy people with sickle cell traits.